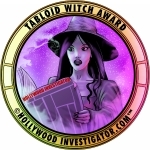 [HollywoodInvestigator.com] Horror fans and film festivals don't quite know what to make of Motern Media's output. Motern markets its films as horror, but the stories and characters -- even the monsters -- are more charming than scary. "I sometimes describe our movies as straight-faced comedies," says Matt Farley, lead actor in Motern's two feature films: Freaky Farley and Monsters, Marriage and Murder in Manchvegas. "We package them as shocking horror films, but they're actually quite tame. That's part of the joke. Same goes for the way the characters behave. As filmmakers, we try not to comment on the ridiculous qualities of the characters. We think it's pretty funny. "The reviews from horror sites have varied. Some are angry with us for failing to deliver any scares or gore. Some reviewers don't appreciate the joke. Others appreciate our sly approach." Although lacking in scares, Motern films are admirable for their originality. While most indie horror films feature copycat zombies, slashers, and torturers, Motern films are aesthetically unique. Not necessarily for everyone, but easily distinguishable from everyone. Matt Farley and Charlie Roxburgh are the creative force behind Motern. They co-write the scripts, which Farley produces and stars in, while Roxburgh directs. Freaky Farley (2007) is about a peeping Tom turned serial killer (played by Farley), who is released from prison on condition that he kill the Trogs -- monsters who inhabit the nearby woods. It sounds very bloody, but neither "freaky Farley" nor the Trogs are particularly scary. They attack like children playfully patting their "victims." These attacks are occasionally intercut with gore shots that look both faked and out of place. All the younger characters (i.e., people in their 20s) suffer from arrested development. Freaky Farley is a peeping Tom who still lives at home and submits to his father's discipline. 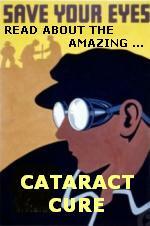 His nascent girlfriend, Scarlett (Sharon Scalzo), wishes she were Nancy Drew and enlists Farley on her fantasy missions around town -- by climbing in through his bedroom window. (What she does for a living, if anything, is never addressed.) "Girl next door" Katy pines for Farley's affection, but although she works at a radio station (an adult job), she rides a child's bike and wears childlike pigtails. These twentysomethings talk and behave like children. Lots of eye rolling, heavy sighs, and "Aw shucks!" to express displeasure, diluting any "horror" with their endearing innocence. They evoke the early 1990s sitcom, Get a Life, wherein Chris Elliott played 30-year-old newspaper delivery "boy" Chris Peterson. "Get a Life happens to be a favorite of Charlie -- he's a big fan of Chris Elliott," says Farley of his partner. "We don't go out of our way to make our characters innocent. We're just more inclined to write those kind of characters. It gives them a classic quality that might be easy for some audience members to identify with." Freaky Farley's innocence is bolstered by its quirkiness. Much as in Twin Peaks, oddball characters pervade the film's Americana small town. There is the flaky witch, street poet, ninja, and "bearded hobo" -- because "Just calling him 'hobo' sounds less interesting," according to Scarlett. Arrested development, innocence, and quirkiness recur in Motern's second film, Monsters, Marriage and Murder in Manchvegas (2009). Once more, Matt Farley plays a Man Child, one of three friends in MOS -- Manchvegas Outlaw Society. It's the sort of ominous-sounding, yet benign, club that the Hardy Boys or Little Rascals might start. Manchvegas is innocent and quirky to the point of retro, evoking the Eisenhower years. MOS members make a living by selling newspapers, CDs, and used paperbacks, which they pull around town on a toy red wagon. In their off hours, they swing on rubber tires by the river, plot Hardy Boys type fantasy missions, and converse on huge walkie-talkies and tin cans connected with string. Manchvegas is set in 2009. Have these characters never heard of smart phones? "We try to create a world we'd like to live in," explains Farley. "I'd much rather live in a world where people communicate with walkie-talkies and cans on string. That would be a lot better than cell phones. We think that walking someplace is much better than driving there. That writing a letter is better than sending an email. We incorporate that into our scripts. And we think it's pretty funny." 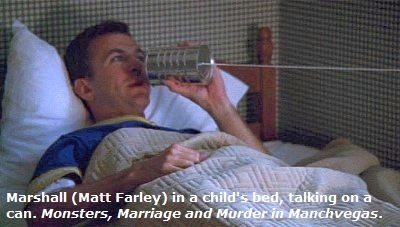 And as before, Farley's adult character (Marshall) suffers from arrested development. Fellow MOS member, Jenny (Marie Dellicker), wants to date him, but he'd rather ruin other people's dates than go on one himself. He behaves as though, stuck in preadolescence, he still thinks that girls are icky. Adding to both films' innocence are makeup effects and acting that appear to be intentionally "bad" and unrealistic -- much like an SCTV parody. In Manchvegas, Melinda (Sharon Scalzo) is kidnapped by Gospercaps. These monsters are nearly identical to Trogs. In both films, the monster costumes look like a bunch of rags. Gospercap faces are obviously masks. The "gore" makeup is obviously -- makeup. No attempt is made at realistic monsters or gore. Acting is likewise affected and unrealistic. Fights appear staged. Freaky Farley kills Trogs with his bare hands, flailing at them like a child pretending to kill. This is also how the Gospercaps kill the archeologists. And when Melinda hits a Gospercap over the head with a rock, it's obvious that no contact is made. "We watched lots of horror films from the '70s and '80s," explains Farley. "We love these movies for what they are, but also for what went into making them. Lots of them were made by people with no filmmaking experience and almost no budget. Our favorite movies are the ones that promise lots of horror but deliver very little. There's something very charming about a failed attempt at frightening people. That's what inspires our movies. "We did the best we could for the monster costumes with our limited budget. We knew they wouldn't look realistic. And, yes, we figured it would be funny. It's in keeping with our straight-faced comedy approach. "We love moments in low-budget horror when a character is running away, scared, from a creature that wouldn't frighten a 3-year-old. It's so charming! "Unlike most horror fans, we aren't impressed by gore. The killings are often the least interesting parts of our favorite horror movies. The awkward scenes between the killings are the best. It's great to watch inexperienced actors delivering poorly-written lines. "We don't tell our actors to act poorly. We tell them to do the best they can. That's when you get the best 'bad acting.' When someone is trying to act poorly, it's not nearly as entertaining. We want naturally stilted dialogue. "The same for our fight scenes. In a perfect world, it might have looked more realistic when Melinda hit the monster with a rock. But we were in a rush. We don't pay our actors. We can't expect them to give us more than a day or two to film all their scenes. So we told Sharon to pick up the rock, and do the best she could to make it look like she was hitting the monster without hurting me -- I was the one in the monster's suit for that scene. "As far as I'm concerned, it turned out perfectly 'bad.' We couldn't have planned it any better! "You see him remembering, midway through the line, that he was supposed to say 'townspeople.' As soon as we cut, he apologized and suggested we do it again. We told him there was no need. It was perfect! "The film was so expensive that we tried to avoid second takes, anyway. I'm sure that's the reason why so many awkward scenes ended up in the final cuts of some of our favorite low-budget horror films from the 1970s and 1980s." Monsters, Marriage and Murder in Manchvegas was "so expensive" not only because of this retro aesthetic style -- recreating the ineptitude of 1970s and 1980s low-budget horror films -- but also because of its retro production choices. Unlike most every indie horror film today, Manchvegas and Freaky Farley were shot on film, not video. And so, like 1970s low-budgeters, Roxburgh and Farley were loathe to waste expensive film stock on retakes. Why didn't they just use one of the many "film look" post-production processes available for video? "I don't think there are any post-production processes that can truly replicate the 'film look'," says Farley. "We had made a few movies on mini-DV, but by 2006, we were ready to make a 'real movie' -- and that meant film. The film represented about 70% of the budget -- about $14,000 for each film. "We used a Russian super-16mm camera that was built in the 1970s. It got us through both movies with hardly any problems. It only held three minutes of film. We had to stop to change the film frequently. We didn't get any of it developed until after we had completed all the filming. "It's risky to put all that work into a movie, without knowing what any of it looks like. We were pretty satisfied with the results when we finally looked at them. We spent around sixteen straight days filming each movie. In the case of Freaky Farley, there was a little damage to a few scenes that required us to do a few days of reshoots. "What was best about shooting on film was that everyone on set knew that we were filming a real movie. This wasn't fooling around with a video camera anymore. I made sure that all the actors were fully aware of how much money was being spent on the film. This added a level of focus to the proceedings that we didn't have in previous productions. "In Hollywood, a $14,000 movie would seem very cheap, but these movies were personally financed. It seemed like a lot of money to me." Roxburgh and Farley met at Providence College, Rhode Island, in 1996, where they began making films. "We both have day jobs," says Farley. "We spend a few years saving up money and vacation time while working on the script. Then we try to film everything over a two to three week period. I find that's the best way to stay focused and get the project completed." Their third film, Don't Let the River Beast Get You, begins principal photography this August, with much of the cast drawn from their previous films. It will be shot on HD video. "Our film camera finally stopped working," says Farley. "It was sad, but we decided to give the new technology a try. We'd also like to do a sequel to Freaky Farley someday. The rough idea involves Farley raising an army of Trogs to battle the mayor's army of ninjas." To date, neither of Motern's films have played in any film festivals. "It's expensive to enter festivals," says Farley. "We entered each movie in fewer than ten festivals. None of them accepted us. "In the credits of Freaky Farley we write 'Phone Freaky Farley' followed by my phone number. We did the same with 'Call Marshall' in Manchvegas. The few 'real fans' we have had noticed the phone number in the credits and called me to say hello. That's more gratifying than being embraced by a film festival!" Motern Media has a website.